Quick overview An upstart French duke who sets out to conquer the most powerful and unified kingdom in Christendom. It is an invasion force on a scale not seen since the days of the Romans. One of the bloodiest and most decisive battles ever fought. This book explains why the Norman Conquest was the single most important event in English history. An upstart French duke who sets out to conquer the most powerful and unified kingdom in Christendom. It is an invasion force on a scale not seen since the days of the Romans. One of the bloodiest and most decisive battles ever fought. 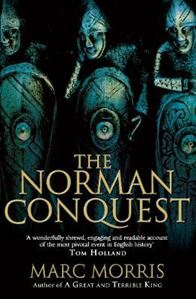 This riveting book explains why the Norman Conquest was the single most important event in English history. Assessing the original evidence at every turn, Marc Morris goes beyond the familiar outline to explain why England was at once so powerful and yet so vulnerable to William the Conqueror's attack. Why the Normans, in some respects less sophisticated, possessed the military cutting edge. How William's hopes of a united Anglo-Norman realm unravelled, dashed by English rebellions, Viking invasions and the insatiable demands of his fellow conquerors. This is a tale of powerful drama, repression and seismic social change: the Battle of Hastings itself and the violent 'Harrying of the North'; the sudden introduction of castles and the wholesale rebuilding of every major church; the total destruction of an ancient ruling class. Language, law, architecture, even attitudes towards life itself were altered forever by the coming of the Normans. Marc Morris, author of the bestselling biography of "Edward I, A Great and Terrible King", approaches the Conquest with the same passion, verve and scrupulous concern for historical accuracy. This is the definitive account for our times of an extraordinary story, a pivotal moment in the shaping of the English nation.